The Art and Mystery of Food: Grey, Black, Carling, Pigeon Peas and "Burning the Witch"
I was raised in Heywood, north of Manchester, in the late 40's/50's. Black peas and parkin, prepared by a variety of mothers, were standard at Guy Fawkes' Night bonfires. As, oddly, were brandy-snaps. Were the brandy-snaps a local tradition, or were they served on this occasion elsewhere in S. Lancashire? Hi Roger, that is very interesting information about the black peas in Heywood. 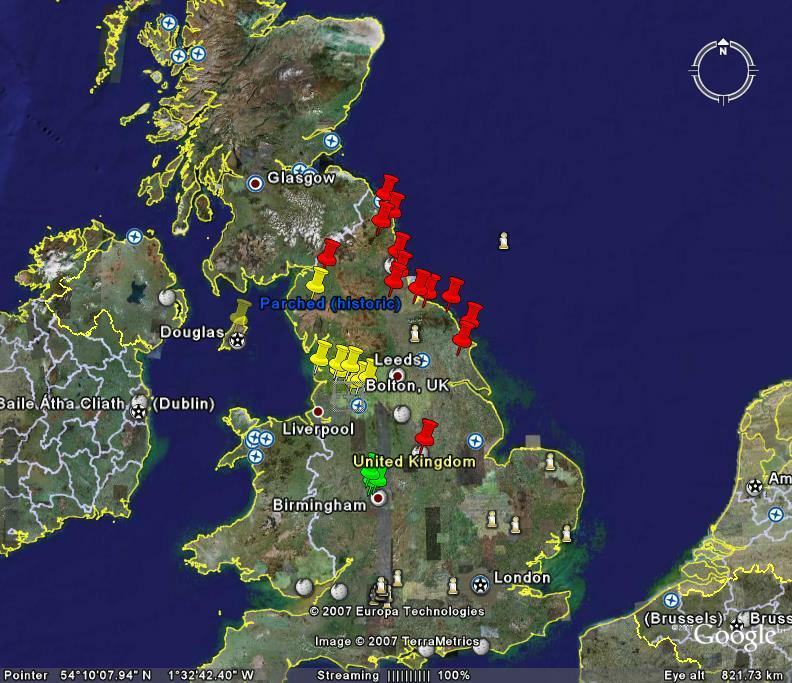 As it is the first reference from Heywood I will give the town a pin on the map! Also very interesting infomation about the Brandy snaps. They are part of a wider tradition of wafer eating from the medieval period onward (see link at the bottom for more historical wafers). Ultimately they most likely are derivative of communion wafers. Eating brandy snaps and simlar wafers were often associated with particular festive dates (especially Mothering Sunday)and were also often known as "fairings" as they were sold at regional fairs. Other names for this type of wafer are Mothering Sunday wafers, Honiton and Ormskirk gingerbread. This is the first bonfire night reference I have seen so that it very interesting in itself. Do you remember if they were flat or curled? Curled. Am planning to try the Burnley fig pudding recipe over the weekend, before the South Carolina temperature gets too hot for that sort of food - we were already in the upper 80's F a week ago. A little brandy or dark rum will probably help as well. Back to the black peas. They were clearly accepted as "standard" Bonfire Night fare in Heywood, so I think you will likely find that the black pea belt stretched through Bury and into North Manchester. A very interesting article about Carlings. We used to eat them on Passion Sunday instead of green peas. The next day we had them fried up with the cold meat. This year I wished to revive the family custom, but couldn't purchase them anywhere in Newcastle upon Tyne; I tried markets, health food shops, and a Polish grocery shop. To be honest, most of the shopkeepers didn't have a clue what I was taking about. A pity, I think. the only place that I know of with a regular supply is Booths supermarket on the west coast. You may be able to get them from pet suppliers as they are mostly grown for pigeon food (hence pigeon peas), but as these are not food grade then you may have to pick out stones etc. I take it you are from Newcastle area? How long ago was it that you last ate them in this region? The Carling Pea which circulates among gardeners in the UK looks like an old medieval field pea. 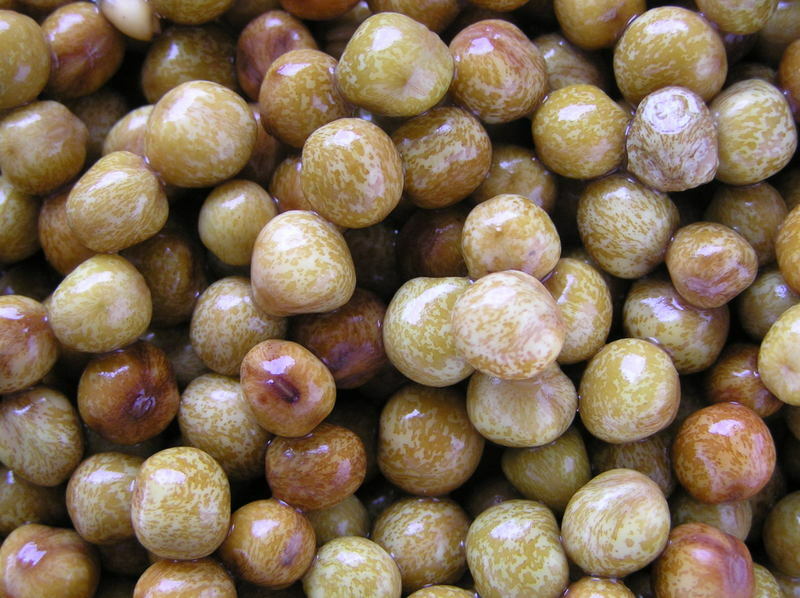 The seeds are brown and speckled, and look quite unlike modern green peas. Robert, there is a Carling pea mentioned in gardening circles as going back for centuries, but I'm unsure if this is actually the case. Speckled field peas are still an important field crop in many countries and new types are still being developed. For instance that strains "Courier" and "Crown" are relatively recent developments in New Zealand for instance. Also "Carling" doesn't every seem to have been a specific variety, more whatever field pea that was used to make carling peas. Certainly when I have grown commercial maple peas bought at Booths supermarket in Keswick, they match the description of the so called medieval Carling pea that I have seen described. My earliest encounter with Parched Peas was in Preston. Firstly as a child on Autumn evenings around Halloween and Bonfire Night. Booths sell Maple Peas for parching. wonder if my friend that first put me onto parched peas had met the same guy, as they told a very similar story about 1980's Preston. I have tried to cook black peas for the last few years just befoe bonfire night but cannot get them to go soft. Is there a special way to cook. I have a picture of my gran stirring a huge pot of black peas in Bolton in 1948 for a huge neighbourhood bonfire which is a tradition my family have continued. We have black peas, parkin, toffee apples, potato pie and treacle toffee every year, just as my gran had in the background of her picture back then! Hi excellent article, I live in Bolton and have had black peas and parkin on bonfire night all my life until last night I assumed everyone enjoyed such delights. I asked someone from York if they had any black peas on bonfire night he thought I was mad so I asked some more people, no one had heard of them ,amazing. Agreed; a great article. My memories are classic North East: Carlin peas with ham on Passion Sunday. As a child 50s/60s we were not 'allowed' to use 'bad language' but revelled in the rhyme 'Carlin Sunday, Fartin' Monday' - a reference to the after effects of so many dried peas! As a child 7ish in a place called southmoor nr. stanley co.durham i ate carling peas they were in a dish cold covered with water.I was staying with my maternal grandmother,she was Irish i'mjust short of 77 now. I as a boy came to Canada in 1948. Parched pea were often sold in Blackpool on the sands. They were sold in little paper cone shaped containers.I just tried to make some here with peas brought back from England by my brother. they don't want to split. soaked them overnight. I remember the 'Black Pea Man' coming around on an adapted bike (I think) selling black peas. I lived in Castleton but he travelled throughout the Rochdale and surrounding areas. He had a bell, rang it and shouted - always a favourite around November 5th but he used to sell throughout winter. He was called Mr White I think and a real Rochdale chararacter. I used to know his daughter in the 70's. I live in Norfolk now and have had my sister trekking around to get me some black peas. The peas cost 60p and the postage £4.00! There is a stall on the corner of Preston Flag Market who still sells hot parched peas all year round. You can season them with vinegar provided. This year is of course Preston Guild Year (once every 20 years) so what better time to celebrate this heirloom pea variety than with a cup of the parched kind. My first memory of parched peas is from the traveling fair that visited Preston at whitsuntide, then my Nan making them at home for Bonfire night along with bonfire(treacle) toffee. Yes, in the 1980's a "Kershaws Super Cockle" man used to visit Preston pubs in the evening, with his wicker basket of seafood snacks but the most popular item was cold parched peas, served with salt and the obligatory dash of malt vinegar! I no longer live in Preston so no idea if this goes on these days. Hot cooked parched peas can still be had on Bury market. All the comments remind of my childhood but as I now live in France you never see the black wonderful pea. Hi I'm presently soaking Black Peas bought in Glossop Market Hall, I was born in Ashton but grew up in Bardsley, Oldham. Black Peas were as already mentioned part of our Bon Fire Night Supper, or after collecting 'Bonti wood'. We still have them in cups served with white pepper and vinegar, my children / family love them. Friends in Rochdale, Wigan & Bolton know about them yet in parts of Manchester they have no idea; its so strange. I buy my 'black peas' from Bolton Market. Several greengrocers sell them there dried in bags ready for soaking. Also, nearer to Bonfire Night certain vendors sell them ready soaked. They also sell them on Bury Market. P.S. To achieve soft peas soak for at least 24hours in plenty of water and 2 tsp of bicarbonate of soda. Remember to rinse well before cooking to remove the bicarb taste.